This is one of my favorites. It’s bold and dark. I love white, black and red together. I’m really becoming obsessed with what i call comets or trunks or stems. They are thrown lines of paint, that can be manipulated by velocity arm angle and even wind. 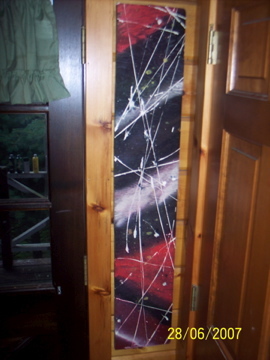 The base is spray paint, and in fact only the white comets are acrylic. Yum. What color-space could be better?